Almost a year ago, the Innovation Diploma facilitator team began imagining an intensive field experience at the Stanford d.School. While Mount Vernon has been a school steeped in design thinking for about six years, and while the iDiploma foundations are built solidly in design thinking methodology, we know that we can continue to stretch ourselves and grow capacity as strong practitioners and coaches of human-centered design. What’s more, the Interim Term at Mount Vernon allows for a week of complete immersion into an experience, and we hypothesized that such immersion would be transformational for our current cohorts of innovators. So, after proposing to the K12 Lab the idea of a week-long, co-created challenge, we began collaborating with Susie Wise and Ariel Raz to collaboratively set the conditions for a design thinking field experience for the 22 student-learners and four facilitators of Mount Vernon’s iDiploma program. The week has been truly outstanding. For our challenge, we established an initial frame of “How might we establish friendships and build community?” Actually, in the late fall, we brainstormed some possible frames, and the iDiploma cohort members worked through a selection of the challenge that most appealed to them. For our user base, we planned to design for the Stanford undergraduate students – people who have made a transition from high school to college and have been living this new-friendship-and-community-building change. Throughout the winter planning and during the onsite experience, Ariel Raz has served as our chief facilitator. He is truly masterful as a designer and leader, and we are all the better for having worked with Ariel. Our co-facilitator is Durell Coleman, and we have learned so much from Durell’s rich experiences, as well. Additionally, we have enjoyed moments with a variety of d.School faculty and collaborators, all bringing something wonderful and unique to our skill building and problem-solving arc. The overall map of our week can be viewed on this Google spreadsheet. Overlaying our map, we have threaded the entire week with the “FailForward” lean. Instead of a relatively linear progression through Empathize, Define, Ideate, Prototype and Test, Ariel recommended and co-crafted a flow that showcases prototyping in a more sophisticated way throughout the totality of the phases, which all rely on each other continuously. What follows are quick summaries of what stood out to meet each day, as well as a photo gallery from each day of the experience. As I write this, we are soon to begin Day 5, which is concentrated on storytelling. Readers can also check out the milestone moments with this Storify collection of the Instagram shares. At the d.School, the design thinking process begins with Empathy. I am increasingly convinced that this is the best starting place for dt. At Mount Vernon, our DEEPdt process starts with “Discover.” After this return visit to the d.School for me, my brain (and our team’s collaborative brain) is spinning – in the best way – with the possibilities of reimagining a process flow that honors the wisdom of starting with Empathy. Ariel and Durell mapped the DEEPdt process with the d.School flow so that our teams began the week with shared language and understanding. We oriented to the work space, which I still find evermore magical on my third visit. Then, we almost immediately entered the field work with empathy probes that utilized prototypes to do two things: 1) make some early insights with our users – the Stanford campus residents, and 2) get the “nerves” out with our design thinkers in a new setting, doing authentic design work. On Monday night, we changed roles and became prototype testers for ED338, a d.School course working to create more innovative high school programs. The multi-cycle rounds with these prototypes provided us with first-hand experience as indirect users, and also gave us deeper knowledge about different types of prototype sharing. Such insights built our understandings about the mutually reinforcing phases of empathize and prototype. On Tuesday, we began our day with a special visit from David Kelley. Because we are from Mount Vernon, this is about the highest celebrity/hero sighting we could have imagined. It was awesome, in the truest sense. Then, we grew from an incredible session with Aleta. The session was movement and dance and improv, all wrapped into one, and Aleta guided us in developing empathy and prototyping and exchanging-leadership by using our bodies instead of our auditory voices. It was masterful and magical. The session culminated in four-person diamonds dance-leading each other to practice non-verbal leadership exchange, as well as a mindfulness segment that empowered us to support and encourage each other in this critically important work. Throughout the afternoon, we were deeply immersed in observation and interviewing to get to know our users and their dorm-life and campus existences. Upon returning to the studio, we employed a number of tools to help us analyze and synthesize the data we had collected. In the evening, we watched Extreme by Design, a documentary about a course – and so much more – at the d.School. Because Durell was in the movie, this viewing afforded us a deeper dive into the design-for-extreme-affordability field work and project development. Wednesday was all about Define and Ideate. The purposeful and intentional scaffolding around clarifying user needs and insights stands out as one of the most powerful learning experiences that I have ever personally enjoyed. Ariel and Durell coached us all in more sophisticated and expert ways to develop POVs and translate those POVs into HMW catalysts. Patrick, one of the Design Fellows at the d.School tested his Wayfinder prototype with us. Patrick, and his research partner Kelly, are working hard to transform the very foundations of the high school experience – to empower adolescents to truly learn who they are and want to be, and to rebalance the scale of overemphasis on content-learning that becomes memorize-dump-forget for all too many. “Mo” joined us to add gasoline to the Ideate phase. Mo’s introductions to some new stoke activities were worth the entire week! As a team, we advanced as ideators in profound ways because of the collaboration offered from Mo, Ariel, and Durell. And during lunch, we met Mark from Farm Hill, who provided us the most delicious meal I’ve ever eaten and shared his story of starting his company in the Launch Pad course at Stanford’s d.School. Thursday was all about prototyping. Again, the purposeful scaffolding and facilitation that our d.School collaborators provided helped us stretch and grow in fabulous ways. Our process-knowledge capabilities expanded exponentially with regard to prototyping techniques and context-setting for testing prototypes with users. For me, I continue to feel the best “magic” happen when design thinkers share and test their prototypes with the users. A small army of users cycled through multiple stages of testing and iterating with the iDiploma crew. Building on the theme of the week, we deepened our understanding of how to use prototype testing as a richer, more high-res method of empathy interviewing. In fact, empathizing and prototyping are wonderfully entangled and virtually unseparate-able in my mind now. In similar fashion to the previous days, the richness of the stokes pushed us immeasurably further in our sophistication of experiential prototyping. We are forever the better for this learning. Well, iDiploma Director Meghan Cureton (@MeghanCureton) seized on that insight and started an adVenture series that the Disney Cohort named “Consultivation.” In short, an outside person spends a 90-minute session with the Cohort to work through a rapid design lab to address a challenge or opportunity he or she faces in work or business. Today, the iDiploma Disney Cohort hosted its third consultivation. The chief engineer for NAES (North American Energy Services) joined us to share a challenge his team is facing in communication. A photo gallery of the consultivation can be found below, and a Google doc of the facilitation flow is also provided. If you are looking for creative and productive ways to blur lines between “school” and “real world,” you may want to consider something like our consultivation. Our student learners are not only amazing future resources, but they are incredible current resources – growing designers who want to and can contribute to real-world problem solving and solution seeking. Our client left this morning saying that he was extremely excited to explore the solutions our iDiploma Disney Cohort created – hybrid systems that combine and integrate already-available tools which work together to address the needs that our user shared with us. He also indicated that he was leaving with a “standard” against which to measure future, potential solutions because of the needfinding and prototyping that was made visible this morning… in just 90 minutes. How do you teach “The Explorers” at your school? Stop and think about that question for awhile. Interpret it. Ponder it. Did you interpret the question to mean, “How do we teach about Vasco da Gama, Magellan, Columbus, Lewis and Clark, York, Shackelton, Earhart, Nellie Bly, etc. ?” How do you teach those persons and their incredible stories? Do you hold them up as heroes? At least as important to discovery and building of knowledge? Are you holding them up, at least a bit, as models for your student learners – as people or dispositions or pursuits to emulate? Perhaps you interpret no real appreciable difference in those two digestions of the initial question. Maybe you see them as something akin to two sides of the same coin. For me, teaching explorers and exploration is essential. Better yet, creating the conditions in which learners can learn exploration and be explorers seems even more my calling. In 2004, I became a father for the first time. It happened again in 2007. Two boys. And while I love and adore my own father – and respect him immensely – we did not spend a great deal of time together as I was growing up. As a father myself, I wanted to be the incredible dad that my father is, while also figuring out ways to spend more time with my own sons. As my boys got older, I worked to understand more and more ways to accomplish this goal. When we embark on an #fsbl journey, we commit to observation journaling. Sometimes we use paper and pens/pencils, and we almost always use a smart phone to record pictures – milestones – during our outings. With these images, we upload our questions, our findings, our hypotheses, our ponderings, our wonderments, our befuddlements. For many years, we have recorded these postings to our favorite-at-the-moment technology tool – sometimes Posterous, sometimes WordPress, sometimes Instagram. On each tech tool, we have set an auto-post to Twitter (with hashtag #fsbl) so that we might invite in teachers and co-explorers for our own corp-of-discovery team. We’ve now done this for nearly seven years, and we are well-practiced explorers, ethnographers, and archivers. From our explorations, we build micro-curricula. Things we want to continue exploring and learning more about. In formal schooling, it’s too often the other way around. From curricular decisions made by a well-meaning teacher, short-term explorations are enabled to “enrich” the lesson or unit. School tends to privilege curriculum deriving explorations. #fsbl privileges explorations deriving curricula. How does it happen naturally in our lives outside of school? What if school progressively transformed to more deliberately derive curricula from explorations and human-driven curiosity? Such is the core purpose of experimenting with observation journals as something of an “excuse” and invaluable tool to get out and explore together and to create breadcrumbs to which to return at another time! 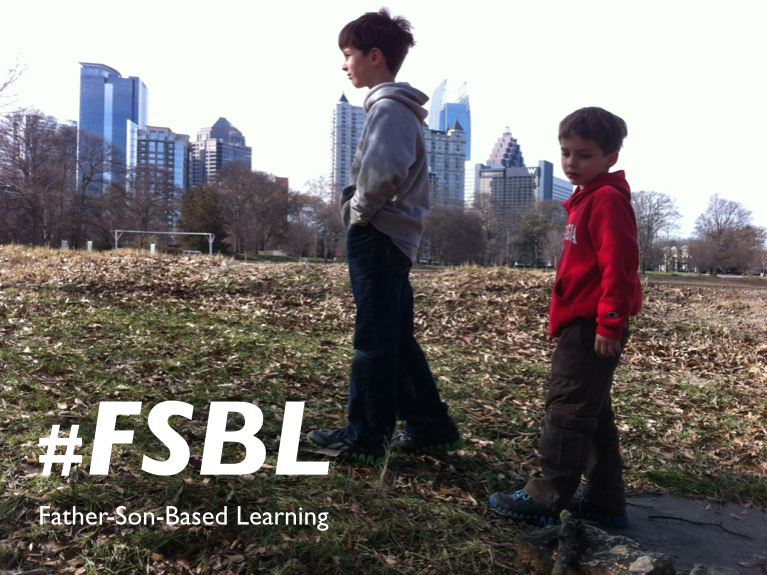 After a few years of practicing with #fsbl, I began to wonder about scaling this model to my “other children” – the student learners at my school. If observation journaling could build micro-curricula for my sons and me, then could a networked group of observation journalers – EXPLORERS – co-create exciting and pursuable curricula derived from our own synergized curiosities? In the fall of 2010, Synergy 8 was added to the middle school curriculum at The Westminster Schools, where I taught and principaled at the time. Essentially, a number of micro-curricula were derived from the co-explorations and collective observation journaling of the Synergy 8 team. My teaching and learning partner Jill Gough and I established some categorical learning outcomes (see and explore the Synergy 8 link above) from which explorations could be launched and upon which explorations could be reflected. At the core of the experience, though, one could find a heart of observation journaling. As learners went about their days and existences, they developed stronger and stronger habits in capturing their curiosities, their wonderings, their questions, and their befuddlements. These observations were chronicled and archived with tech tools similar to those used in #fsbl, and the Synergy 8 team built a virtually bottomless pool of potential and actual curricular pursuits. Through selected observation journal posts, Synergy 8 team members opted into such projects as “Is Graffiti Art or Vandalism?” Several opened an internal advertising agency. Four boys became interested in the English Avenue area of Atlanta and worked through initial thoughts of urban gardening to solve a perceived nutrition problem, only to be encouraged in another direction by a community member who showed them four nationally-registered urban gardens and explained that what they needed were jobs to solve for 70% unemployment. So, the boys developed a partnership with Fleet Corp and hosted a job fair for the community. At the points of reflection along the way, we, of course, discovered a lot of interconnected nodes of learning that might be sub-categorized as “English & Language Arts,” “Maths and Statistics,” “History and Social Sciences,” “Economics,” etc. More importantly, these students pursued ways that they could contribute as citizens now – not just future resources always preparing for something they were told would come in the future, but current resources who wanted to – and were perfectly capable to – make a dent in the present. To work well beyond the domain of green-covered grade books or siloed subject areas. These projects, and many more, started with exploration of community, observation journaling, and learner-curated and derived curricula. As you might have predicted from the chronological flow described above, one set of the tools and methods we use in Innovation Diploma is ethnography, discovery, and observation journaling. From the cohort members’ explorations, they originate ventures – both (i)Ventures and coVentures. With (i)Ventures, an iDiploma member pursues an individual objective through the lenses of inquiry, innovation, and/or impact. With coVentures, a small team of iDiploma members collaborates more interconnectedly to create new value and entrepreneurial or innovative enhancement in some thing, event, community, process, or product. If one traced backwards to a point of origin for any of these ventures, one would likely discover an exploratory observation and chronicled curiosity jotted somewhere to launch a purposeful endeavor, all clothed in dynamic exploration. Jumping off from such a point of origin, the Innovation Diploma cohort embark on incredible expeditions informed and forwarded through design thinking and The Innovator’s DNA. We are born insatiably curious. It’s how we learn. In too many cases, though, curiosity can be shoved to the back seat, or even completely tossed out of the vehicle, in environments we call “school.” Yet, we talk of nurturing innovators and being innovative in schools. What if we more purposefully pursued the traits and mindsets that we know are essential to the “Innovator’s DNA?” How might we grow our curiosity muscles and build integrated, real-world learning pursuits through observation, questioning, experimenting, and networking? We are looking forward to joining with a new corp of discovery at Traverse, and we are excited to share some of the methods and tools we use to create opportunities and utilize environments for exploration and discovery. More than anything, we are thrilled to imagine what we might build together with those attending and exploring with us. We will be teaching the explorers… and learning from the explorers! What curricula might we derive from our explorations? What new ways of doing school might we discover?! Meghan Cureton (@MeghanCureton) shares an early chapter in pictures for (i)Diploma — Mount Vernon’s Innovation Diploma (@MViDiploma). I’m privileged to co-facilitate the cohort with Mrs. Cureton. On May 11, 2014, I will (quietly) celebrate a third anniversary. That day will mark the moment that I have spent exactly three years watching a TED talk every day. Being an educator, as I watch TED talks, I think about how they might “fit” into school. I sometimes imagine the speaker as a student in a typical high school, and I wonder what courses and subjects his or her talk would align with. And often that exercise bothers me. It bothers me because I imagine a speaker like David Epstein prepping and preparing his “Are athletes really getting faster, better, stronger?” talk embedded below. I wonder…. Would David be doing this “project” in math class? In science class? In history class? In English class as a persuasive speech assignment? Maybe in some technology course? Would he be so lucky as to have teachers who would allow a single project to “count” for all of his courses? After all, the project integrates a number of disciplines that we subdivide and separate in school. What if at least part of David’s school day allowed for him to pursue the project of his dreams and interests and the subject-area lenses were more like threads in a tapestry that David is weaving? And what if that deep project identification and discernment had developed partly because of more innovative “homework” that encouraged and made room for David to explore his developing passions and curiosities? And what if the subject areas in his school behaved a bit more like “subjects on demand” and recitations in which David could schedule time with a relative expert to spend some concentrated time digging into the statistics or biology specificity that he needed for his emerging understanding? And what if his assessments were more akin to badges and endorsements showcasing the disciplinary, interdisciplinary, multidisciplinary, and transdisciplinary knowledge, skills, and understandings that David was building? And what if David were at the center of his own progress reporting and learning conferences? Then school would look different. Because form follows function. Enjoy the talk. It’s amazing. Heutagogy - the study of self-determined learning. I’m so happy right now.